Protein Blend (Whey Protein Concentrate, Whey Protein Isolate, Pea Protein Isolate), Brown Rice Flour, Vegetable Glycerin, Vegetable Oils (Palm, Palm Kernel, Soybean), Soy Protein Isolate, Maltitol, Sugar, Chicory Root Fiber, Water, Cocoa, Baking Soda, Natural Flavors, Sunflower Lecithin, Whey, Mono and Diglycerides, Non-Fat Dry Milk, Beta-Carotene, Vitamin A Palmitate, Soy Lecithin, Potassium Sorbate, Almond, Peanut and Sucralose. Contains Milk, Soy, Almond, Coconut and Peanut. Manufactured in a Plant that Processes Milk, Soy, Wheat, Tree Nut, Peanut and Egg Products. Protein Blend (Whey Protein Concentrate, Whey Protein Isolate, Pea Protein Isolate), Brown Rice Flour, Vegetable Glycerin, Vegetable Oils (Palm, Palm Kernel, Soybean), Soy Protein Isolate, Maltitol, Chicory Root Fiber, Sugar, Water, Baking Soda, Cinnamon, Natural Flavors, Sunflower Lecithin, Whey, Mono and Diglycerides, Beta Carotene, Vitamin A Palmitate, Soy Lecithin, Potassium Sorbate, Almond, Peanut, and Sucralose. Protein Blend (Whey Protein Concentrate, Whey Protein Isolate, Pea Protein Isolate), Brown Rice Flour, Vegetable Glycerin, Vegetable Oils (Palm, Palm Kernel, Soybean), Soy Protein Isolate, Maltitol, Sugar, Chicory Root Fiber, Water, Cocoa (processed with alkali), Baking Soda, Natural Flavors, Sunflower Lecithin, Whey, Mono and Diglycerides, Non-Fat Dry Milk, Beta Carotene, Vitamin A Palmitate, Soy Lecithin, Potassium Sorbate, Almond, Peanut, and Sucralose. Introducing the Her Whey lean protein cookie! Delicious Soft Baked Protein Cookies with only 230 Calories, gluten Free, Low Fat, Low Sugar, and Low Net Carbohydrate! 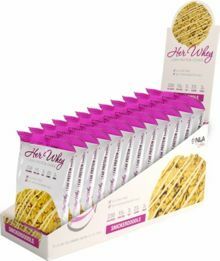 The Lean Her Whey Protein Cookies were designed to provide you with a mouth watering, gluten free, protein packed treat. Our cookies allow you to indulge and satisfy your wildest cravings anytime, anywhere, completely guilt free! Each delicious, soft baked cookie is only 230 calories and boasts 15 grams of whey protein. This flavor is so delicious that you might mistake this delicious, soft baked, protein packed cookie with Grandma's secret recipe! The only difference is, instead of setting back your physique and performance goals, the Her Whey Lean Protein Cookie will catapult your progress forward and allow you to indulge in pure deliciousness, while consuming your protein needs, without the extra calories. Do you crave and miss the taste of a delicious, cinnamon and sugar cookie, but you have restrained yourself because you thought it might hinder your physique goals? It's time you can let loose and throw your discipline out the window! Our soft baked snickerdoodle cookies taste like a generously topped sugar cookie with a slight hint of cinnamon. The best part is that you can enjoy each bite and indulge in this secret pleasure anytime, anywhere completely guilt free!